So... it's been very hot in New York these past few days, in the 90s, and yesterday I decided to hit the beach. I wore my bikini from two years ago (I haven't bought a new one yet, I will as soon as the bikini club is over). I found myself trying to cover up with my magazine and being self conscious in general. I didn't like that. So I've decided to schedule my meals for the coming week in advance and to completely eliminate a few items that I've still been indulging on. I will try this for one week and check the results next Sunday. The items I am eliminating are chips and soda. My goal is to eat more vegetables and fruits. I will only have bread in the mornings, and maybe with the eggs (I gotta dip it in the yolk!). And I will only drink water, still water. The "Anything I want" days are still about veggies and maybe meat. No soda no chips rule still applies. This is what I am working against. I've measured my stomach, and while I'm almost happy with the 27 inches at mid-waist, the 30 inches below that classify (in my book) as bulge. In general, I feel that the two numbers should be closer to each other, like 27 and 28. Or 26 and 27. I will measure myself next Sunday to report any progress. I hope you girls are all sticking to the previous drills. 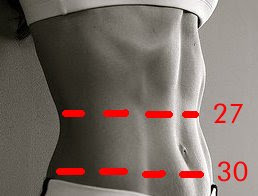 And if you can, try something along these lines, with a lot more control on the diet. Also, please feel free to make any suggestions and to share your diets. As for exercising, this week it will be yoga, belly dancing and weight lifting. Four days. On the beauty side, I am really taking care of my body with a lot of scrubbing and extra moisturizing time set aside every day. So how is your bikini routine going? You inspired me to measure my belly. 29 and 30. Not pretty, huh? I'm 5'2" and my frame is small in general, so my numbers will not apply to everybody. Also, you are better off than me, because your numbers are close to each other. Maybe you can try and take them down to 28 and 29 if you're not happy with 29 and 30. This belly is NOT getting measured! LOL This past weekend I did a slow 1/2 hour on the treadmill and will attempt same today. Today I will also go to the gym and work out with weights. I need to get back into it slowly. The food is difficult for me, as my doc has recommended staying off fresh fruit/veggies until I am 100%. I have oatmeal with soy milk for breakfast. I have also been having lots of yogurt, sometimes with a healthy version of granola added for variety (dairy is also a no-no, but doc said yogurt is ok.) Grilled chicken is also on my menu, usually with a whole grain side dish - WW pasta, brown rice, spelt, etc. I'm really hoping the resumption of exercise will help me get better. Well, those of us with smaller waists but giant pelvic bones will never get those numbers too close! Confidence goes a long way regardless of what your measurements are... and yours are great. I'd love to have those - and I rock my bikini. I've had two kids so I'll probably never have a perfectly flat stomach again - my body just isn't made that way. But I still get hit on and lots of looks. Be confident and stop hiding with the magazine!!! I ran my 5k this weekend. I know 3 miles doesn't sound like a lot, but I'm not a runner so this was a big accomplishment for me. But my food intake got a little out of control over the weekend (frozen yogurt w/ bad toppings and pizza!). So starting today I'm back on a serious "eating healthy" routine and have also planned my meals for the week. I will report back in a few days and tell you how it's going. Oh, I've also given up all alcohol for 2 weeks! This will be tough since I really enjoy my glass of wine at night. Actually yes 28 and 29 sound good. I don't have a big or round belly, but it's not flat either. My biggest problem is my thighs and the ugly cellulite. I try to run and walk three times a week to slim down my thighs. How do you make the cellulite go away????? I know, I know, you are right, but there is that quest for perfection that keeps getting on the way. Also, I have no kids so I really have no excuses for a belly! For me this is also a bit of a self-test. Can I do it? Can I still have a toned and slimmed down body? I mean, the alternative is what? Give up? And that's when the pounds start piling. I think it's good to always keep an eye on your eating and exercising, otherwise (al least in my case) it all goes nowhere. Good going on the alcohol, I understand, I'm giving up soda. We'll see if we see any big differences. cellulite is tough to beat. I will try to blog about it next week. You need to change the diet for it to go away some, but there is not much you/we can do. Have you tried any of the products specifically for it? I've read that massaging can help some. How much do you want to slim down your legs? Did you ever get a the Coach bag? the WW is Whole Wheat. The anything I want is going to be still very controlled, I promise, well maybe a little less on Saturday. I want to lose 2" in every thigh. I wear size 10 in bottoms. I really wish I could wear size 8. In tops, I wear size 8 or 6. But I'm happy with that because I know my upper body cannot get any thinner than this, even if I have a flatter belly. Hi Dee! I have a very similar body proportion as you, so I understand where you're coming from. I’ve always been "curvy", with a smaller upper body and waist, and then bigger hips/bottom. To slim the legs/hips area and remove some of the cellulite, I recommend cardio of course, but then adding in some squats and lunges which will really help tone that area. To me squats and lunges are the worst to do, but I try to incorporate them into my routine 3 times a week and it definitely has helped slim down my thighs.